Saturday couldn’t have been any better. After a morning of rock climbing out at Stoney Point, Bart, Heidi, and I headed over to San Bernardino to catch the 2:30 van up to Marshall. 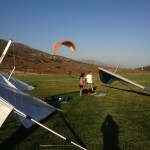 On the way to Marshall, the van stopped at Crestline to let the hang gliders out. The wind was maching at Crestline… a solid 20 miles per hour with even stronger gusts. We were concerned we wouldn’t be able to get off. 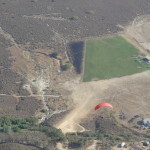 Fortunately, the wind wasn’t as strong at Marshall and as we pulled up, we saw a hang glider slowly climbing at the house thermal. We got out and were greeted with light cycles. We quickly spread our gear and launched. The thermals started out pretty light. Bart got up right away, but I had to scratch around for ten or fifteen minutes before finding my ticket upstairs. The thermals started building and turned rowdy rather quickly. We were pushed and rolled for the better part of an hour and a half before conditions started to mellow again. Once we got high, we did some mini-XC and headed toward Pine Mountain. We didn’t have the altitude to connect directly- and, while it was a buoyant glide, we couldn’t find the lift we needed, so we headed back. We bounced around and played tag as we hopped from peak to peak. With the exception of a few hang gliders, we had the sky to ourselves until the 3:30 and 5:00 vans showed up for the glass-off. The lift was smooth and abundant by 5:30 so we boated around until after 6:30. As always, there was a party in the LZ and we were greeted by a friendly crew when we landed. We saw a few Santa Barbarinochigans… including Susumo. I’d only ever seen him at the training hill- so it was fun to watch him ridge soaring out front at Marshall. 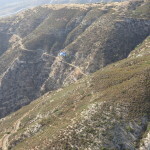 I hadn’t been flying in forever… so when Bart called and asked if I wanted to meet him in Ojai to paraglide at Chief, the two hour drive seemed like a mere inconvenience. 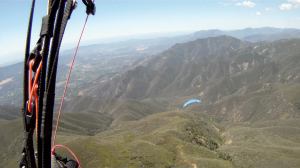 I got up at the crack of dawn and met Bart, Chris, and another new pilot at Nordhoff High School at 9 am and we headed over to check out the LZ. By the time we got back, there were two other pilots waiting. We wasted no time loading the Suburban and by 9:30, we were on our way up. When we got to the top of the mountain, it was blowing over the back… but by the time we got to launch, light cycles were coming in. Bart, NewPilot, and I went over the flight plan with Chris and started to lay out our gear so we didn’t miss the window. One of the local pilots launched first- but he didn’t get much. He was able to scratch around at Twin Peaks- but was never able to bench back. The rest of us waited for about fifteen minutes until stronger cycles started to come in. NewPilot was first in queue and managed to stay high. 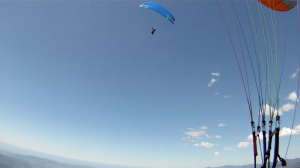 It was his third high flight so he played around out front- bouncing back and forth between the peaks. Bart launched next and I followed. The lift was smooth and strong. We were able to stay high and get higher. There was an inversion around 5.6k that we kept bumping our heads on… but we never gave up and our perseverance paid off. After about 45 minutes of bouncing around, a thermal took us through the inversion and we got to over 6k. I fell out of it and was never able to get back up… after bumping my head some more, it started to shut down. Bart tried to go XC and I headed out front to land. My glide was nice and the air was smooth. Bart said it was pretty rowdy as he headed over to Three Stooges. 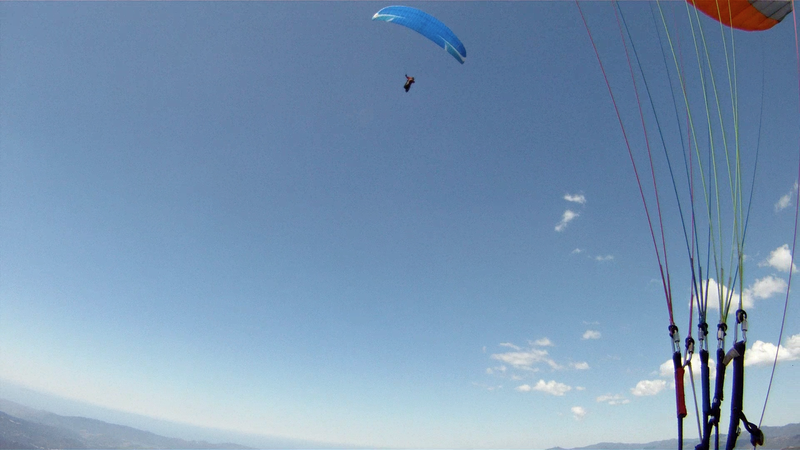 But alas- the headwind proved too much for a lone paraglider and he turned back and landed right behind me. It was an amazing day. Can’t wait to do it again!